Minimum 1943 dime value is $1.24 for a coin in "good" condition through "extremely fine" condition. Most of these silver dimes, if they show worn surfaces, are priced at the value of their silver content. 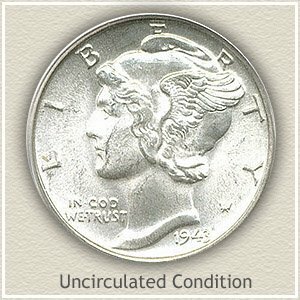 Mercury dimes from 1943 begin to have collector value when they are "uncirculated," a coin with no wear and still lustrous. Collectors today generally collect dimes from this era in "brand new" condition. The value of the 1943 dime pictured is $10 to $20, the bright luster of the coin and the fact it never circulated is the appeal to collectors. If your old dime is uncirculated, separate values are placed on 1943 dimes depending on the mint producing the coin. Three locations, Philadelphia, Denver and San Francisco struck dimes and mintmarks found on the reverse identify each. You can judge the condition of your coins by comparing them to the images representing different stages of wear. Discover how much your 1943 dime is worth. The value chart shows, depending on condition, a mint marked 1943 dime is worth more than the Philadelphia coin. The San Francisco mint used an "S" mark and Denver a "D" to distinguish dimes struck at their facilities. Both mintmarks are found on the reverse along the rim. Dimes without a mark were struck in Philadelphia. A positive reaction to the pleasing light pastel reds and blue toning was in the final price of this rare 1943 Mercury dime. Bidding at a David Lawrence Rare Coin Auction ended at $297.85 a very strong price. Looking below the toning to the surface of the coin it is free of any blemishes, nicks or bruises. Also, the mint did an excellent job imparting a bold, well defined strike. And finally the excellent handling and care this coin has received throughout the years. Well preserved and displaying rare characteristics most coins lack, serious collectors routinely pay above average for these gems. These subtle points, attractiveness of toning, quality of the original minting, lack of abrasions and wear are involved in your 1943 dime value. 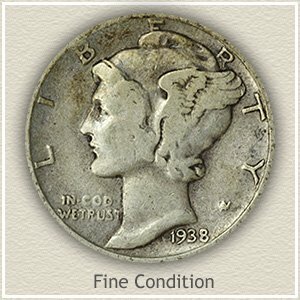 In their search for the right Mercury head dime to add to their collection, collectors judge the condition of each coin, know in the hobby as "grading." Different stages and amounts of wear are separated and given a grade. Judge the quality of your coins, comparing them to the images and descriptions, giving an accurate value of your 1943 dime according to its condition. Uncirculated: A very sought after dime and at the high end of the 1943 dime value, noted for never circulating and not receiving any wear, the coin has remained in brand new condition as the day it left the mint. Both beginning and selective collectors strive to advance their collections into coins of this grade. Inspect the high points of the design to confirm no wear has occurred. 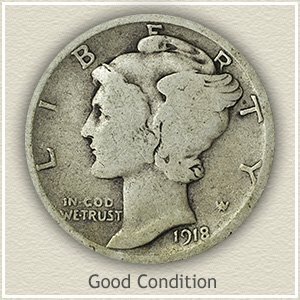 If the coin has circulated, wear starts to appear as a dulling of the luster on Liberty's cheek, curls of hair near the ear and the center portion of the wing. 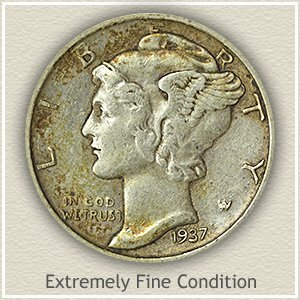 Extremely Fine: Serving for just a short time in commerce a Mercury dime in extremely fine condition is worn but only slightly. All of the major and most of the finer details are visible. Liberty's hair close to her eye, once bold and raised is now slightly flattened and in areas smooth. Feather details also flattened are loosing some definition. Your 1943 dime must portray a clear and fresh appearance. Fine: The design in the center of the coin has worn smooth with just a slight separation of the hair and wing design. Liberty's forehead and hair curls are no longer separated and the majority of the feathers have leveled into one. On the reverse the once distinct bundle of rods is now worn with few vertical lines remaining. Good: The condition of this coin is best described as heavily worn. The date and mintmark are readable, however the majority of the design elements are worn smooth. The easiest area to judge is the rim, if it has worn into the lettering your coin is graded no higher than "good" condition. The value of this dime is mostly in its silver content. 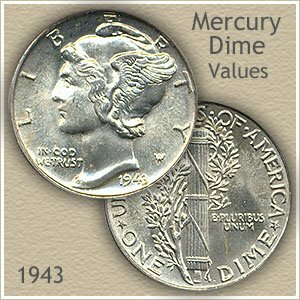 Values listed for the entire Mercury head dime series including more on the 1943 dime value. Rare and valuable dates are scattered through out the series contributing to a large spread in Mercury dime values. 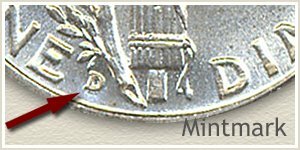 Additionally, the condition of your old dime plays a key role in today's rare coin values. 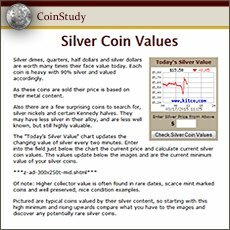 Coin Values Discovery... finds 1943 dime value and... all old US coin values. It is an excellent index with images and text links to all coin series, from Cents to Gold. 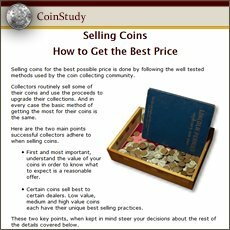 Value charts, grading images with descriptions uncover how much your box of old coins is worth.